План-конспект: Uses local setting of planting crop. Contrasts corn and stones. One can produce life because it has life; other cannot. This illustrates how we are dead in sin until Christ gives us life. Jesus, the way, truth, and life. Sinner's prayer. My friend, I have a question to ask you. Did you ever hear of a person who planted grinding stones so he would get more grinding stones, or pennies so he would get more pennies? If such a man were to be found you would call him a fool. But you plant corn in order that you will get more corn. 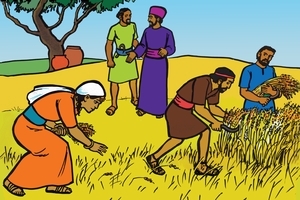 Why do you plant corn, but refuse to plant grinding-stones? I know what you will answer. You will say, "Corn can produce (give birth to) more corn because it has life. Stones have no life, therefore they cannot produce more stones." This is true; even a child knows this. But there is something that many people do not know. Listen and I will explain. God has said to all of us, "You are dead. Sin has stolen away your life-thus you are dead." Perhaps you are thinking, "How is it that God says we are dead? We see. We hear. We eat." But you do not have God's life. God says, "Your heart is dead because of your sin." There is only one way that your heart can get life. You must let God's life come into you. He gives you new life. But God refuses to dwell where sin is. He is holy and He hates sin. God wants people to be His own, but not those whose hearts are dead. They are like stones. For this reason, they will go to the place of fire with Satan when they die, because they do not have God's life in them. All people sin. There is no one who has not sinned. Is there no hope then? Yes, there is hope. Listen. We are not only like stones, but we are also like a decaying (rotten) thing in God's eyes. Sin makes us like that. God turns away from such filth. But God is willing to help us. He wants us to have life. God says: "The only way for you to get life is to receive Jesus. He that has Jesus, the Son of God, has life; but he that does not have Jesus does not have life." Jesus says, "I am the way. I am the truth. I am the life. Come to me and I will give you life." God is the owner of life, and His life is in Jesus. God does want us, but if our hearts remain dead He will refuse us. Do you want to know how to receive Jesus, and get God's life? Jesus said, "I will give life to everyone who receives me." This is the kind of life which never ends. When we die, we will go to live with God forever. But we cannot receive Jesus unless we leave all our sins and follow Him only. Do you want to get rid of the filth that sin brings to your heart? Pray to God. Ask Him to cleanse away your sins and give you His life. Talk to Him now like this, "Oh, God, my sins are many. I ask You to wash my heart and give me Your life. I believe Jesus is the way, the truth and the life. I will receive Him now into my heart. I will leave the path of sin and follow Him only." If you pray in this way God will hear you. He has told us, "Come to Me; I will not refuse you. Come, believing on Jesus, and I will hear and answer you. All who trust in Jesus will belong to Me and I will be a Father to them." My friend, God has said that all have sinned - all are dead. Jesus came that we might have life. Our sins have separated us from God. If we refuse Jesus, then we must go to the place of fire when we die. Jesus came to this earth and made payment for our sins by taking the punishment that belonged to us. He died to make payment for us. But death could not hold Him because He is God. He lives, and He will give us of His life which never ends. Come to Him now. GRN has recorded a version of this script in 160 languages and dialects. See full list.